So, I took a photo of one and of course the glare doesn't help it. But, proof, I have been scrapbooking! And it feels damn good to make something other than a card for a change! And as a side note, there is nothing wrong with cards, or making cards...I love both. 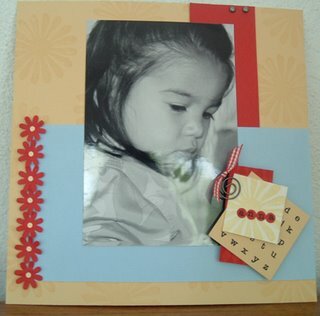 But lately it has consumed all my paper crafting time and I truly just love scrapbooking more. Not that there is anything wrong with that. i love your color choices for this lo and love what you have done with it. great job! you LO is great...i truly understand about consuming time...i feel like i make everyone else Lo's and none for my own books...isn't that ashame?